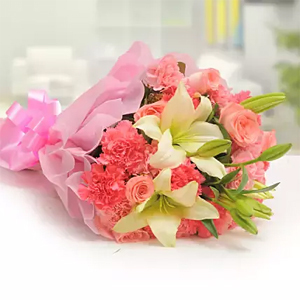 Bouquet of 5 Pink Carnations 10 Pink Roses 2 White Asiatic Lilies Pink Packing Paper Pink Ribbon Green Fillers. 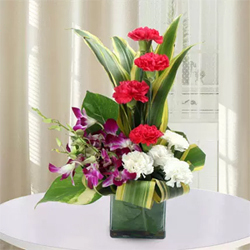 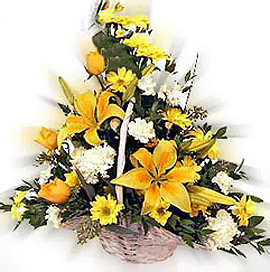 Bouquet of lilies/carnations and gerberas is worth its weight in gold. 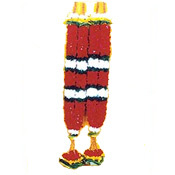 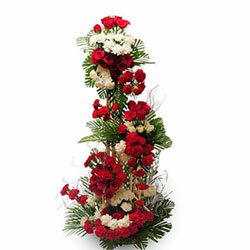 * Lillies or Carnations as per availability.. 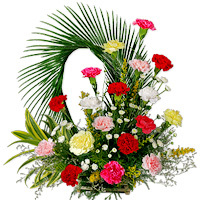 Arrangement of 15 pink carnations will add style and elegance to your home or office..
An arrangement of pink carnation with mixed fruits. 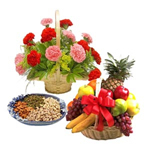 Fruits weight approx 5kgs Fruit Basket may vary as per availability. .
An arrangement of mixed fruits, seasonal available mixed fruits weight approx 6kgs, kiwi, apple pomegranate, grapes, pineapple, sweet lime etc.. and pink carnations.. 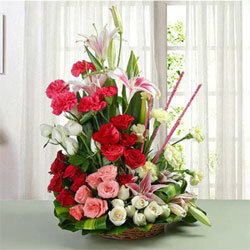 Surprising your loved ones in India can be a tough task. 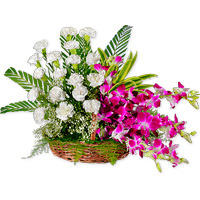 Let your feelings reach out to your loved ones in style through this Gift Hamper of 1/2 kg mixed dry fruits,2 kg fruit basket andA basket of 15 Red & 7 Pink carnation.. 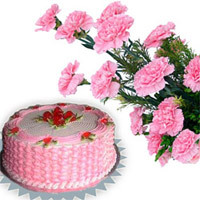 Bunch of 10 Pink Carnations along with 1 Kg Fresh Cream Strawberry Cake . 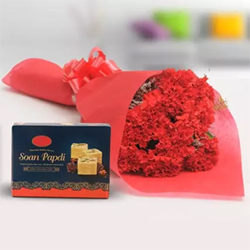 STRAWBERRY TREAT OF LOVE . 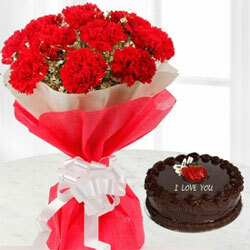 12 Red Carnation Basket 1kg Round Truffle Cake Ferrero Rocher Chocolate 24 pcs.Free Rakhi Roli Chawal. 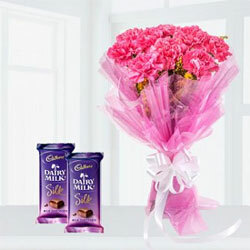 bouquet of 12 pink carnations, a 6 inch white teddy bear, and a chocolate box . Arrangement of Ferrero Rocher Chocolates - 16 pcs., Red Roses - 6, Yellow Roses - 20, Red Carnations - 12 Draceane Leaves & Dry Sticks . 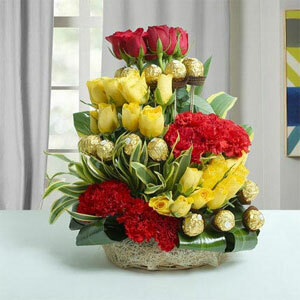 Arrangement of Ferrero Rocher Chocolates - 16 pcs., Red Roses - 6, Yellow Roses - 20, Red Carnations - 12 Draceane Leaves & Dry Sticks. 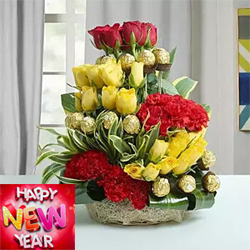 Arrangement of Ferrero Rocher Chocolates - 16 pcs., 12-Red Roses - 15-Yellow Roses - 6-Red Carnations Draceane Leaves & Dry Sticks. 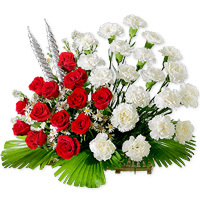 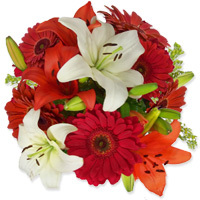 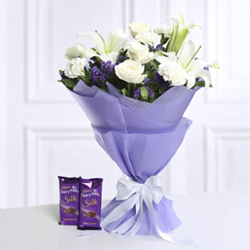 Bouquet of 2 White Asiatic Lilies, 5 Red Carnations and 5 Pink Roses Truffle Cake - 500 grams . 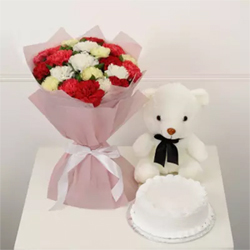 Bunch of 20 Mix Carnations with Half Kg Vanilla Cake & small Teddy. 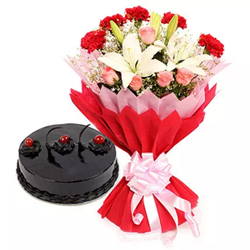 It really feel out of the world when you are in love because love is the most beautiful feeling in one's life. 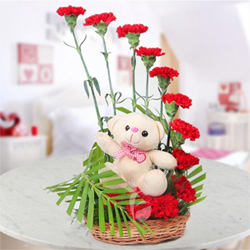 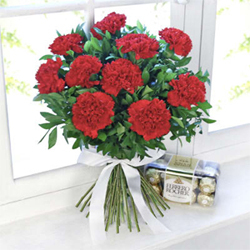 Half moon shaped arrangement of 12 Red Carnations 6 inches Pink teddy. 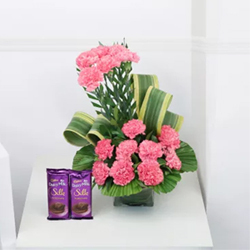 Let the distance never come in your way in terms of surprising and wishing your loved ones on any special occasion Arrangement of Ferrero Rocher Chocolates - 16 pcs., Red Roses - 8, Yellow Roses - 20, Red Carnations - 8 Draceane Leaves & Dry Sticks The image displayed is indicative in nature. 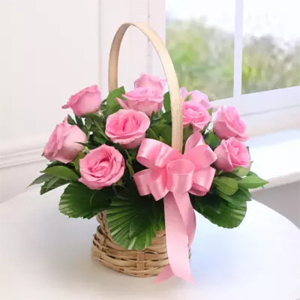 kindly note: Actual product may vary in shape or design as per the availability.